How should we harmonise the three dynamic elements of ministry that I have been posting about in this series? As I have already mentioned in a previous post, one passage of scripture which brings all three elements of proposed ministry models together is the account of the transfiguration. Luke 9:28-29 records how Jesus “took Peter, John, and James with him and went up onto a mountain to pray. As he was praying, the appearance of his face changed, and his clothes became as bright as a flash of lightning.” Jesus prayed to the Father, and the Holy Spirit imbued with supernatural power. The account continues after Jesus and his three closest disciples had come back down the mountain. A man approached them and claimed, ‘“I begged your disciples to drive it out, but they could not.’ ‘O unbelieving and perverse generation,’ Jesus replied, ‘how long shall I stay with you and put up with you? Bring your son here.’ Even while the boy was coming, the demon threw him to the ground in a convulsion. But Jesus rebuked the evil spirit, healed the boy and gave him back to his father. And they were all amazed at the greatness of God.” (Luke 9:40-43). Later the disciples asked him why they had been unable to cast out the demon and heal the boy, and Jesus replied, “This kind can come out only by prayer.” (Mark 9:29) Jesus had been up the mountain praying, and probably fasting, but the disciples at camp had been doing neither. They attempted to cast out the demon and to heal the boy without first praying and asking for anointing. This seems to be the most reasonable explanation of what Jesus was indicating. What else makes sense? Can Jesus possibly be saying that the Father will only cast out certain demons if we abstain from food for a protracted period? This makes no sense to me, and certainly has no scriptural precedents. Jesus commands us to drive out demons. Mark 16:17 records that one of the signs that accompanies a disciple is that we “will drive out demons.” Deliverance is an authoritative act of power. We do not ask God to drive out demons; we ourselves drive them out in Jesus’ name. This requires both authority and power. 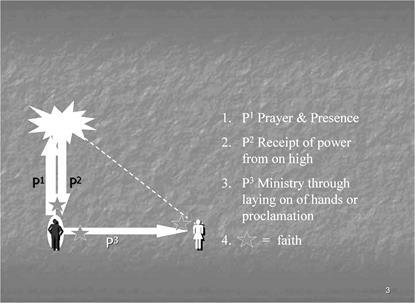 In this account, the three elements of ministry come together – prayer, the receipt of power, and proclamation. Here is a repeat of the diagram. This model presents several challenges, each with definite implications, for the individual Christian and for the church as a whole. Without prayer, there is no receipt of power from on high. Without proclamation, there is no release of power into the world or the lives of others. Without receipt of power (anointing) there is nothing to impart other than ideas and physical actions. In my experience, most prayer meetings tend to polarise at one or other ends of a continuum. Either they are quite well controlled affairs where people pray in turn, or they are rambunctious happenings with much communal praying in tongues, loud warnings to the devil, and so on. Perhaps we, particularly in the more conservative churches, need a new vision for prayer meetings. Envision a meeting where the group starts its time of prayer with worship, praise, and adoration. Some pray in tongues, individually or simultaneously. Someone leads in a well-known song of worship. One after another, the members express the group’s concerns and hopes to Almighty God, agreeing with each other and adding to the prayers already offered. Someone reads out a text, another expresses the corporate desire for direction and revelation, while yet another describes a vivid mental picture that he/she feels has relevance. Slowly, but with a sense of certainty, those in the group become aware that the Holy Spirit is directing them in a particular way, and so they unite their minds, hearts, and prayers to this end. Let’s say that they determine that the Lord wants them to intercede for a particular young man in the local church who is preparing for a missionary visit to a distant country. The sense is that he is doubting and becoming discouraged, and that the required finances are not yet in place. They call out to God and ask him to fill them again with power from on high. They present themselves before the Lord and, in faith, believe that they are receiving an anointing which will enable them to act in Jesus’ name. A member of the group says that he feels that two of them should go to the young man, lay hands on him, and encourage him. Another confirms this. Two volunteer, and the others lay hands on them and send them off with prayer. Those remaining in the meeting start to proclaim aloud, but at normal volume and inflection, that God has dominion over all the affairs of humanity. They declare the authority which God has delegated to the church. They address the dark spiritual forces which may be blocking the flow of finances into the young man’s life. They address potential donors as if they were present, and they bless them and profess their openness and obedience to the Holy Spirit. What I have described is by no means a new experience for some churches. In my opinion, however, much of what takes place in prayer groups where this sort of scenario takes place is relatively uninformed. The members tend to conduct their meetings roughly along the lines described, not because of theological or biblical conviction, but because it is part of their particular tradition. I contend that we should purposefully embrace the three elements of prayer, power, and proclamation as the example set by both Jesus and the early church. We should guard against making it a thoughtless tradition, and we should resist incorporating humanistic or emotionally driven practices. For instance, I find no evidence of Jesus shouting so that the powers and principalities could better ‘hear’ him. Nor do I find evidence to suggest that we need to speak out the exact words of scripture as found in the King James Version. In my next blog post I will be describing what I think could be done differently.